Taking the next step in your lives and choosing to start a family can be very exciting, but in reality it can also cause great financial hardship. Using the initiative to better understand your finances, when choosing to start a family, is a great way to see where your money is being spent and where it could possibly be saved. While you may have a savings account set up and be on top of your monthly repayments, there are a number of other ways in which you can further improve your financial situation. While it may not be the first thing that you consider, debt consolidation can reduce your monthly interest repayments, helping to save you thousands of dollars each year. If you want only the best for your family, make your money work for you and start getting the most out of your finances. How can Debt Consolidation Help your Family? Not only can having a number of financial repayments each month be a burden, but it can also make budgeting virtually impossible. Being financially stable and knowing that you have the income to support your family will take a great weight off your shoulders. While it is important to compare the loans on offer to you, your new debt consolidation loan can often provide you with a lower interest rate and lower account keeping fees, helping to make managing your finances easier. 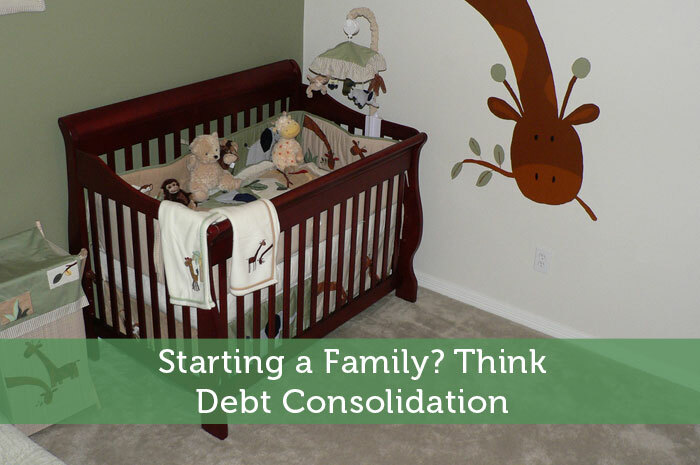 Debt consolidation solutions offer a number of great benefits to new families. Not only can you save thousands of dollars each year in interest rates, but you will also be able to more easily manage your debts and accounts. All new parents will tell you that your days suddenly seem shorter, often running out of time to complete every day, menial tasks. By combining all debts into one new loan, you free yourself from the hassles of tracking numerous repayment dates and amounts. In turn, this makes it easier to continually make your payments on time, thereby eliminating any late payment fees. If you have an adverse credit history, consolidating your debts can often improve your credit rating by making your debts more manageable. Creating a good credit rating will provide you with a more sustainable financial future for you and your family. If you think that debt consolidation can help your family, talk to a debt solutions specialist who will be able to assist you in finding the right loan for you. Determining what expenses can be consolidated will help you to see how much money you could be saving every year. With the money that you have saved from consolidating your loans, you can rest at ease knowing that your family is safe, should any unforeseen expenses occur throughout your lives. Have you ever had to consolidate any loans when facing debt? Is it something you would consider if faced with overwhelming debt? I’m fortunate in that I’ve never gotten myself into enough debt to consolidate. My family members have though, and it’s been a bumpy road for them. Consolidation is good as long as you don’t just get yourself into further debt later. Yes if you get that desperate you better be willing to take major steps to fix the root of the problem. At the very least, they should get reading a bunch of finance blogs for ways to save money and earn more. When I first started getting out of debt 5-6 years ago I utilized a debt consolidation company and it worked out very well. A lot of people are against the service but it absolutely fits in some situations and should be a consideration for people that have high-interest rates credit cards and personal loans (maybe even medical debt). The downside is that if you have small amounts of debt then it might not be a viable option, however if you have large balances then it’s certainly worth looking into. Good to hear that it can work out well. It does have a rather poor reputation, but I wasn’t sure why. It seemed to make sense to me. Credit card interest rates would be pretty important to avoid while trying to get out of debt. Wouldn’t it be better to pay off your debt before starting a family?? Very true Bridget. I’d be pretty wary of starting a family while dealing with a debt problem. Perhaps this would more apply to those unplanned pregnancies where you are suddenly forced to get that debt under control. I consolidated a number of years ago and it worked really well. It helped me get payments that were affordable and manageable. Within an year I had my debts paid and I have not gone into debt since. Good to hear Miss T. Getting out from under a debt problem in a year would be a challenge without some real help. Like some other commentors, I haven’t had enough debt to warrant consolidating. Just be sure you’re getting a good deal. Debt consolidation companies have a bad reputation for a reason, so be careful in finding one that will actually help you. Personally, I agree that ideally you should get your financial house in order well before having children. At least get high-interest consumer debt paid off before trying for a baby. I know my wife and I saved up enough money to cover most of the first year’s baby expenses before we even started tryingto conceive. Yes, definitely do proper research into the company before trusting them with something like this. Some do use rather shady tactics which can hurt your credit. Saving up plenty of money for having kids would be the best route, but I guess sometimes it’s unavoidable. Having some extra savings would make things a lot less stressful. Debt consolidation can be a great tool if you get a lower interest rate and have stopped the habits that get you into debt. If the freed up credit will lead to more overspending you will be in for a world of hurt. I’d be interested to see some stats on how many people fall right back into debt after climbing out. A lot of people just don’t learn their lesson. I got a loan to consolidate credit card debt once. I didn’t close either credit card, however, and just ran up the balances on them again. But I don’t have any of those accounts open any longer and am working on the last of that debt. I like to think I’ve learned my lesson, I haven’t applied for any sort of credit since then! That’s too bad that you fell back into the same problems Edward. It seems like you are on the right track now though. Keep it up. I’m with Daisy on this one. Debt consolidation is fine as long as it doesn’t just lead you into more Debt! I’d also be very wary before securing anything against my property. I only mention this as a lot of large consolidation loans are secured loans. That would be scary to put your home on the line when fighting debt. You have to do more than just put a bandaid on the problem. You need to actually solve what leads you into debt. I’ve had a couple of friends that have been in debt, which I’ve advised them to consider consolidation. And 100% of those have managed to control repayments, and none have been in debt ever since thus far! It’s a really good option to take for anyone considering it. lol thanks for the flattery, but I don’t know if my mish mash of blogging tips and financial advice would be of much help to them. You must be doing a good job if your clients don’t get back into debt. I guess some companies just care about helping them with the current problem while some care about helping clients long term. Interesting to read others experiences because I have never had to do this, but I have always been curious if it was worth it for people. Yeah I found it pretty interesting too. You always hear so many bad things about it, but it sounds like almost everyone here had a positive experience when they had to resort to it. I guess the key is finding a good company. Another chime in for “have kids only when/if you can afford them.” I saw a few cases that were pretty unfortunate when I was growing up, where the families really couldn’t afford to have their several children. I know it’s not always possible, but I wish some people would just think in advance, even if that means a consolidation loan. It’s another thing entirely to have life go upside down when you’ve already got children. It is really unfortunate when they have multiple kids in such a situation. I could see one being an accident, but if they’re dealing with a debt problem after that, they should’ve learned their lesson and been more careful. I guess some of them just didn’t appreciate how much kids actually cost which ended up putting them in debt or made it tougher to deal with existing debt. I think that credit consolidation is a very good solution to your debt problems. The most important thing to keep in mind is that one should decide to consolidate as soon as possible, because with every passing day is going to be harder and harder to catch up with interest rates. Moreover, consolidation will fix the temporary problem, but will not deal with a person’s ill spending habits that are usually the source of all debt problems (that will be transferred on to your family). So, in order to have a healthy and balanced budget one must not only solve temporary problems but also establish some good spending habits. Good points Karen. Debt consolidation may be a temporary fix but in the long run you really have to get to the source of the problem. If not, you’ll just come full circle again and get into more debt problems.